I’m in the habit of taping or tacking up pictures of cool birds I’ve never seen. It’s my own little bucket list, expressed visually with images from magazines and the pages of old “bird a day” calendars. The pictures seem to taunt me, as if to say, “Good luck, but you will never find me.” That confounding worm-eating warbler is a particular nuisance. Occasionally I do track down one of the birds in my gallery, and then the photo comes down. The ritual feels like progress, and the open space is soon filled by another “most wanted” species. In early March, progress arrived in the form of a Bohemian waxwing, a winter beauty from the north that wandered into Chicago’s Jackson Park. The bird stayed in a small area just south of the Science and Industry Museum for two weeks, giving area birders ample opportunity to grab their binoculars and scurry down to the lakefront. For many, like me, it was an easy lifer. One or two Bohemians are generally reported in Chicagoland every winter. The species often congregates with flocks of cedar waxwings, its lookalike cousin. The Jackson Park bird was alone, however, and it stayed put because it located a good food source. 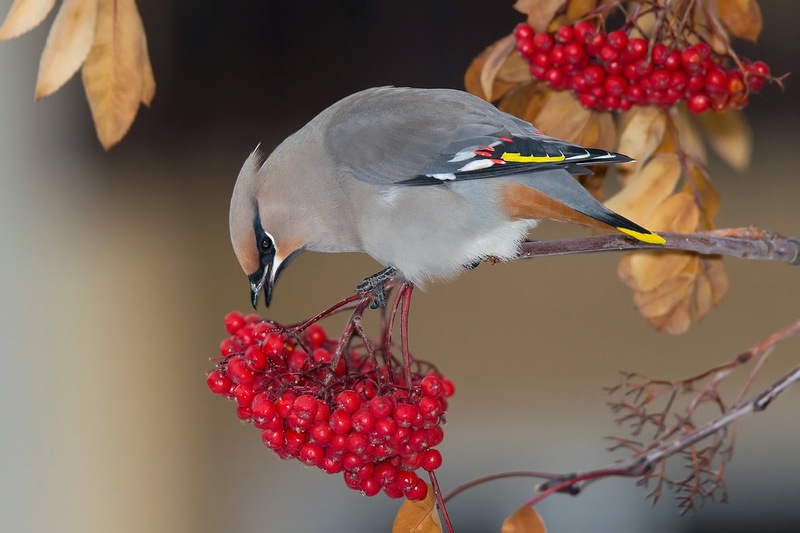 Fruit-bearing trees and shrubs are a waxwing’s best friend. It’s April now, so we should look for cedar waxwing, a common but often overlooked backyard bird. If you are new to birding, or just curious, this is your spring assignment: spot a cedar waxwing. You can do this. The good news is that cedars, while present in DuPage throughout the year, are far more plentiful in spring, summer and fall. The bad news is they don’t visit bird feeders, and that makes them easy to miss. 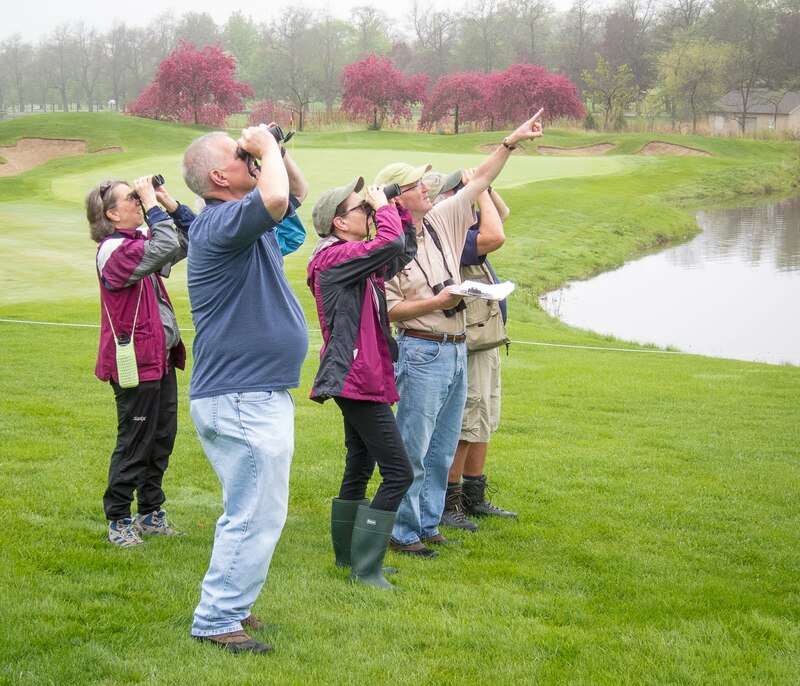 Your first encounter with cedar waxwing might not deliver the view you wish for. You might only see and hear a flock of waxwings flying overhead. This highly social species usually travels in tightly packed groups and vocalizes as it flies. The call is a thin, high-pitched whistle; the flight pattern is undulating or bouncy. Know these clues and, with practice, nailing the ID is simple. Of course, cedar waxwings do occasionally land, and that’s when you really get to admire this bird. It was always one of my favorites as a kid and it still is. The silky sleekness, crest, yellow-tipped tail and black mask are distinctive. Look carefully and you’ll notice some tiny red dots on the wings, too. Adult birds (males and females) have these namesake markings—as if the tips of their secondary flight feathers were dipped in red wax. I think of the waxy droplets as wing jewelry, but ornithologists are stumped as to their purpose. If you notice a flock of smallish, light-colored birds perched at the top of a tree (often one with bare or dead branches) it might be waxwings. Check them out and listen for their whiny call notes. Waxwings are insect eaters during the warm months, and will “sally out” from their perches to catch prey, just as flycatchers do. 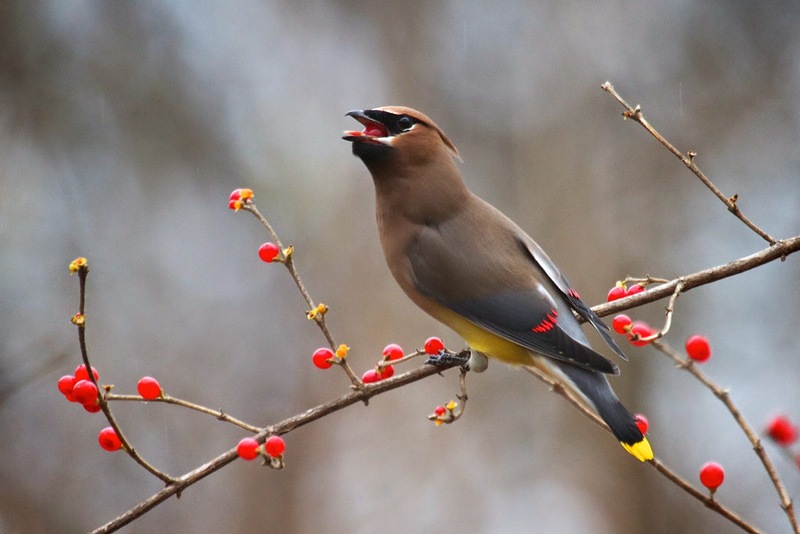 The surest way to attract cedar waxwings to your yard is to plant berry bushes and fruit trees. Cherry, crabapple and holly are a few of their favorites. Such offerings will make other species happy, too. Something I haven’t yet witnessed is the berry-passing game. A group of waxwings, I’m told, will occasionally perch on a branch and playfully pass a single berry down the line, from bill to bill. I really, really want to see that someday. My birding bucket list just keeps getting longer.